One of the great opportunities at the Illinois PTA Convention is to attend workshops by state board members that provide you with new ideas and help you to be a better PTA leader. Illinois PTA Membership Marketing Director Julie Holdeman presented two great workshops on growing your PTA’s membership. The first, Planning a Year-Round Membership Campaign, focused on how to get people to join your PTA throughout the year, including right now at the end of the school year. The second, Analyzing Your Membership for Retention and Growth, covered how to use the information you have on your existing members to help you recruit new members. Below are combined highlights from both workshops. Membership is critical at the local level. Without members, you PTA will struggle to find leaders and volunteers. But beyond that, PTA membership can help to create a sense of community within a school, bringing families, teachers, administrators, and students together as a team. PTA membership at the local level also helps to support the mission of the PTA as a whole, providing a larger voice for the Illinois PTA in Springfield and the National PTA in Washington, DC. Just about everyone, even small kids, recognize the Nike swoosh, McDonald’s golden arches, or the iconic Coke bottle shape. Why? Because those companies have worked hard for decades to make those visual references connect to their brand, and they do it consistently year after year. Your PTA has a brand too—it’s the PTA logo with the “Every child, one voice.” tagline underneath it. There’s even a song to go with that branding. Make sure that the PTA logo is on everything that your PTA sends out. Be sure to follow National PTA’s branding and web guidelines. You can also customize your PTA logo to include your PTA’s name above the standard logo. Make sure that the logo that your PTA uses is consistent with everything you send out. Branding can also be an important part of your membership campaign. By choosing a theme for your campaign, you can create a visual identity that you can work off of throughout the year. The Illinois PTA membership page has three ready-to-use campaigns, complete with flyers you can customize to your PTA. Particularly relevant right now is the “Thanks for the Memories” campaign. You can make a pitch to the families in your school that if they’ve enjoyed the PTA events and resources throughout the school year, they can show their thanks with a PTA membership. An added benefit you can include is that now at the end of the school year, they can join PTA to show their support without fear of being asked to volunteer (this year, at least). Who can join PTA? Anyone who is interested in supporting the activities of the PTA and its mission. That means that your PTA shouldn’t focus just on the families and teachers at your school. Consider reaching out to extended families, since grandparents are just as likely as parents to want their grandchild’s school to have a strong PTA. Ask your superintendent and school board members to join, as well as your mayor, city council members, and other local officials. Don’t forget to ask business leaders to join as well. Strong schools are the bedrock of every community, and their membership can show their support for the schools in the community. All of this information can be helpful in growing your membership. If you have a significant number of members from last year that didn’t join again this year, you can plan a targeted campaign aimed at getting members to keep their streak alive by joining again. For those that don’t rejoin, you can contact them to find out why and what your PTA could do to bring them back. By knowing what grades and classrooms a member’s children are in, you can find areas where your PTA is not recruiting well. Are kindergarten membership numbers down? Make sure you focus on explaining the importance of PTA to your school and sharing all of the things your PTA does for children at the school. Are some classrooms or grades underrepresented compared to others? Perhaps a membership competition between classes or grades with a popcorn party or other school-approved reward would help. If you know when a member joined, you can evaluate how your membership activities have performed. Was a campaign successful or not? Are there areas where you could improve a campaign, or did it just not work at all? Without data about your members, you can’t answer the questions you may have about how your membership efforts are working or identify where opportunities for growth exist. Some people want to know what’s in it for them if they join the PTA. That’s where member benefits come into play. National PTA provides member benefits, as does the Illinois PTA. For example, if you are working to grow the number of grandparents joining your PTA, you might want to share the 15% discount off an AARP membership that they can get as a PTA member. Member benefits don’t have to come from just the National PTA or Illinois PTA. Your PTA can offer them as well. Provide discounts to PTA members at PTA events. Offer a drawing from members for a VIP parking space and front row seats to a PTA or school event. Have drawings for a free yearbook or spirit wear. Plan a membership appreciation night that everyone can attend, but that PTA members get in free (e.g., at a local roller skating rink). Allow people to join your PTA that night to take advantage of the benefit. A local business or vendor can become a sponsor of your PTA through a business membership. Your PTA will need to determine what amount to charge for a business membership as well has how many actual PTA membership cards go with it (usually one, since most businesses just want to support the PTA and not vote at PTA meetings). You can also order business member window clings from the Illinois PTA. Be sure to note on your business outreach materials that purchase of a PTA business membership is not an endorsement of that business by the PTA but is rather a statement of support for the PTA by the business. IRS rules prohibit non-profit organizations like PTA from endorsing businesses. National PTA provides marketing materials in both English and Spanish that you can use to promote PTA membership. Additional membership and marketing materials are available in the online Back-to-School Kit. The Illinois PTA membership page has additional resources, including three ready-to-use membership campaigns that you can customize to your PTA. The Local Unit Packet, sent to your PTA president at the beginning of the school year, has a folder full of membership materials as well. Make sure your officers for next year are registered this spring to ensure your PTA receives the new Local Unit Packet when it comes out later this summer. Finally, if you have any questions about membership or marketing your PTA, Illinois PTA Membership Marketing Director Julie Holdeman will help you in any way that she can. Founders’ Day, February 17th, celebrates the legacy and work of Alice McLellan Birney, Phoebe Apperson Hearst, and Selena Sloan Butler to improve the lives of children. The date marks the first National Congress of Mothers, held in Washington, D.C. in 1897. As part of that celebration, National PTA designates the week that includes Founders’ Day as PTA Take Your Family to School Week. This year, PTA Take Your Family to School Week is February 13-17, and the theme is Celebrating the Changing Faces of Families. Research shows that families engaged in their children’s education results in greater student success, regardless of race, ethnicity, class, or parents’ level of education. PTA Take Your Family to School Week provides PTAs with an opportunity to engage the families at their school in their children’s education. It also promotes your PTA and the work you do in your school, which can lead to more families joining your PTA to support that work. Now is the time to think about how your PTA will bring families into your school building. Do you want to provide the opportunity for families to share a meal with their children, either before, during, or after school hours? Will you work with your principal to provide families the chance to participate or observe in the classroom? Do you have no idea where to start? If your PTA isn’t sure where to start, both National PTA and Illinois PTA have resources to help you host a fun, pre-planned event for the families at your school. National PTA also has an invitation letter to send to families and specially-sized graphics for your PTA to use on social media to help you promote your event. Plan your event now to celebrate PTA Take Your Family to School Week. PTAs and PTSAs at the middle school and high school level often struggle. It’s not that families are no longer involved with the school, it’s that they are now spread out among athletic boosters, band, orchestra, drama, and other groups as well as the PTA. Here are some ideas to fire up families to engage with your middle or high school PTA. Middle and high school students are notoriously uncommunicative about what goes on at school, and a newsletter would likely end up buried on the bottom of a backpack until the end of the school year. That means that families are hungry for information about what is happening at the school, and PTA is in the perfect position to be that information source. Create an e-mail list to send information out to families and students. Having a laptop at registration, open house, and other events where people can type in their e-mail addresses will save you having to decipher handwriting and avoid bounced e-mails. Work with your school administration to see if the daily announcements can be e-mailed out to families. It may be easier to set it up so a school secretary can send it out once the announcement sheet is ready. Adults already sit in lots of business meetings all day, and adding another one in the evening is not very appealing. Turn your PTA meetings into sources of information rather than conducting lots of business at them. General membership meetings are only needed to approve the annual audit, to adopt or amend the budget, to amend the bylaws, to elect a nominating committee, and to elect officers. Move all other business matters to your PTA board meetings or committee meetings. Highlight what it going on at the school both academically and with extra-curricular activities. Consider having a “vendor fair” of all the clubs and sports at the school. Have teachers spotlight new curriculum or interesting class projects. Provide presentations on student and family needs, such as staying on the college-ready path through middle and high school, how to apply to college, how to fill out the Free Application for Federal Student Aid (FAFSA), or families role in driver’s education. Just as middle and high school families are spread out among many student organizations, those organizations are often all raising funds for their activities, many of them at the start of the school year. Avoid the competition and fundraising fatigue by cutting back or eliminating PTA fundraising. PTAs should always plan their program year before determining how much money they need to raise to implement that program. Changing your PTA’s focus from buying things for the school to doing things for the school, students, and families can reduce the amount of money your PTA needs to raise. Consider making your membership dues sufficient to meet your budget. While some families may be concerned about the higher dues, many are happy to join when told that the PTA will not be coming to them with fundraising programs during the year. Look at non-dues sources of revenue such as PTA member benefits from Illinois PTA and National PTA, affiliate programs from national or local stores (e.g., a percent of each purchase is donated to the PTA), or restaurant dine-out nights. Remember that to protect their 501(c)3 status, PTAs cannot endorse commercial entities (e.g., “Eat at X restaurant because they’re giving PTA 10% of sales tonight.”) but can state that businesses are supporters of the PTA (e.g., “X restaurant is sponsoring a Lincoln PTA night tomorrow by donating 10% of all orders.”). In other words, you can’t tell people to support a business, but you can say the business is supporting the PTA. Many parents, especially those fresh from active elementary school PTAs, have a fear of being asked to do things and cite that as a reason not to join the PTA. Make it clear to your families that joining the PTA is solely to support your PTA and the programs you provide. Let them know that signing up for the PTA e-mail list isn’t limited to PTA members (you’re providing information to all families, and once they see all the good things your PTA is doing, they are more likely to join). You can still do the occasional ask for help through your e-mail list, but be sure to break it down into small bits (e.g., donating paper products, plastic utensils, a dish, or drinks for a teacher appreciation breakfast). Think about becoming a PTSA if you are not one already. Middle and high school students are beginning to take more responsibility and also looking for activities that look good on college applications. Consider adding a student representative (or one from each grade) to your PTSA board. Use teacher and administrator recommendations for potential representatives, as they know which students are well-connected with their peers and what is going on in the student population. 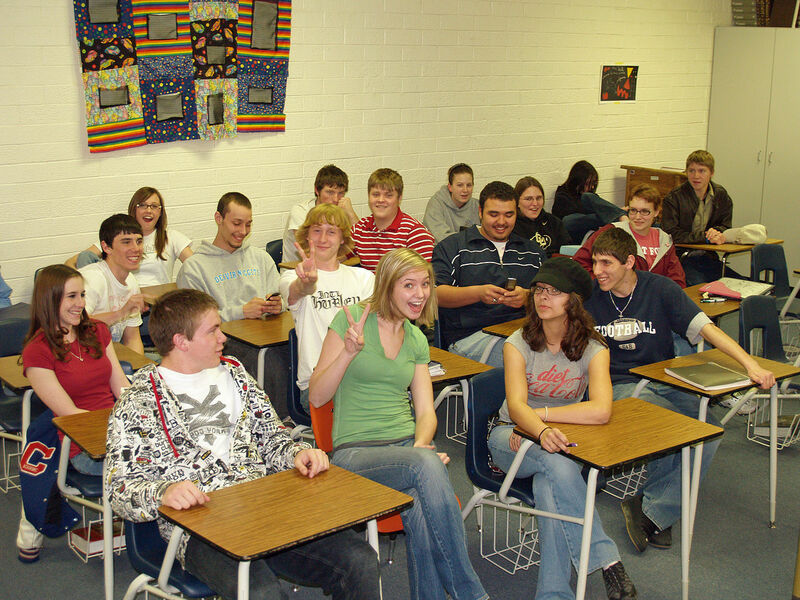 Have the student representative share what students are concerned about at your meetings. Let students sign up for the PTA e-mail list as well, since they may not be able to hear the morning announcements well in their first-period classroom. Photo © 2008 by David Shankbone under Creative Commons license.